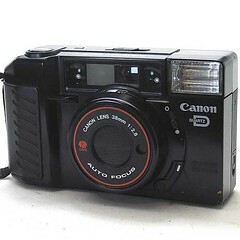 The third in Canon's Sure Shot series, released in 1983, this was known as the (New) Sure Shot in the US, AF35M II in Europe, and Autoboy 2 in Japan. 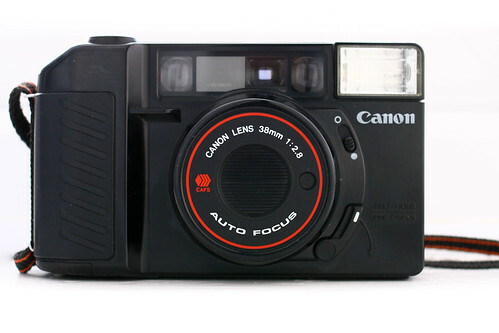 Its specifications are very similar to the original Sure Shot (but with a 4-element, 4-group lens this time) but can be identified by the sloped edge near the shutter release button. Canon sold a set of auxiliary lenses for the AF35M II, for tele and close-ups. Lens: 38mm f/2.8 (4 elements in 4 groups). Triangulation system autofocus with pre-focus lock. Reversed Galilean viewfinder with projected frames, zone focusing marks for near, medium, and far distances, parallax correction marks, battery check and LED warnings. Film speed settings of ISO 25-400 or 50-1000. Integral flash (guide No. 13 at ISO 100 in meters). Film advance: Auto-loading and winding. Power: Two 1.5V AA batteries. Dimensions and weight: 125×76×46 mm, 300g. (New) Sure Shot in the Canon Camera Museum. This page was last edited on 24 September 2016, at 22:09.